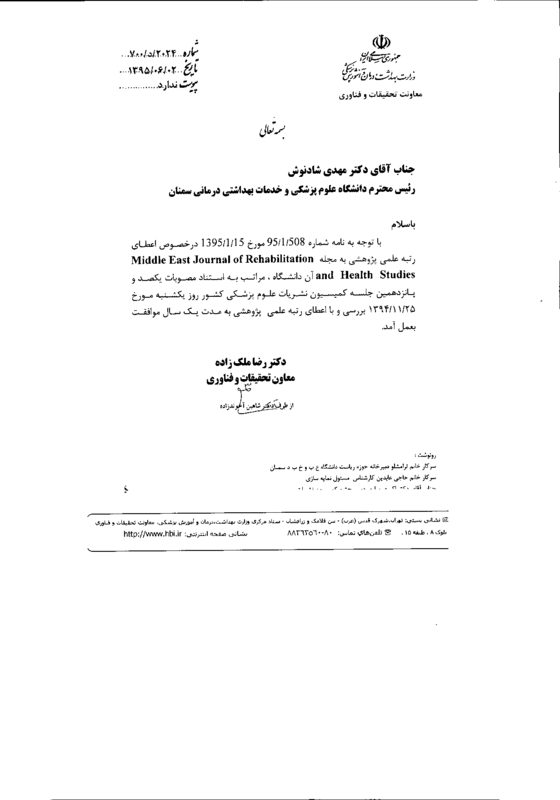 Publishing Approval Minister's deputy office in press and publicity affairs of ministry of culture and Islamic guidance according to certificate number 94/1407 on 20 April 2015 as international quarterly medical journal. All fields of Medical Sciences from Basic Research to the Clinical and Experimental Studies. Students, academicians, and clinicians are encouraged to be a part of this initiative by contributing, reviewing and, promoting scientific works published in the Middle East Journal of Rehabilitation and Health Studies. 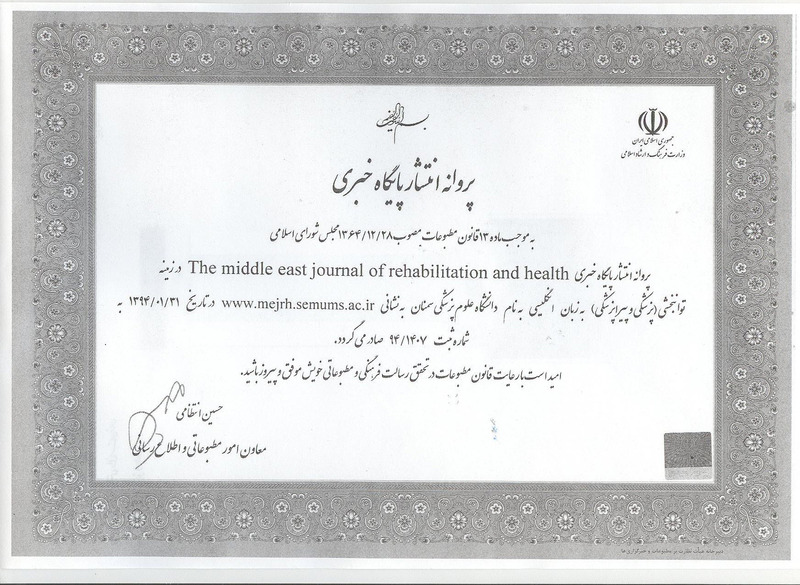 Content Coverage Middle East Journal of Rehabilitation and Health Studies (MEJRH) is a quarterly academic English journal supervised by the Ministry of Health and Medical Education of Iran. The journal is available in electronic version. Topics covered in this interdisciplinary journal include rehabilitation and health studies. MEJRH welcomes contributions in this fields in the form of original research articles, case reports, letters to the editor, review articles, brief reports, debate articles, and study protocols. Category Topics covered in this interdisciplinary journal include physical, mental and vocational rehabilitation; speech, language, and hearing rehabilitation; physiotherapy; occupational therapy; speech therapy; kinesiology; sports physiology; athletic injury management; athletic training & rehabilitation; performance enhancement drugs and effects and health studies. Article Processing Charge Middle East Journal of Rehabilitation and Health Studies does not receive any APC from authors and all article types are free of charge.